I am about to share with you a very special memory from 1985. It’s no secret many of my nostalgic roots are grounded in the autumn season, Halloween in particular. As a kid I looked forward to the month of October sometime around July so I would always flip the kitchen calendar ahead to see what it had in store for the upcoming season. The year 1985 won hands down. 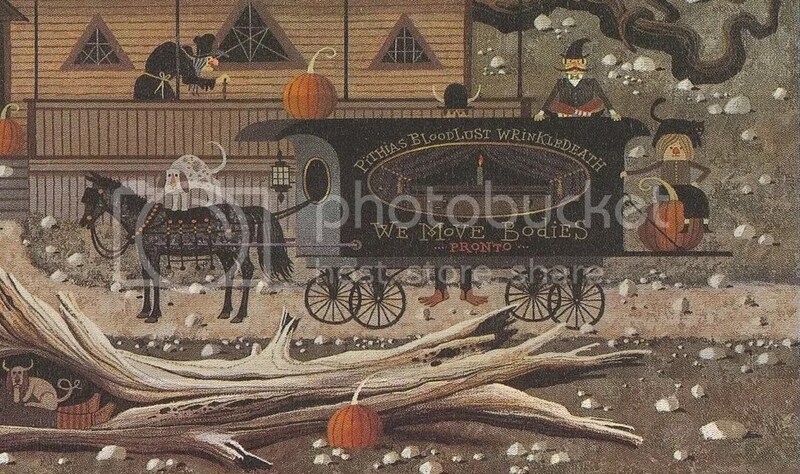 Mom always had Charles Wysocki calendars and I am sure if you grew up in the 80’s, you are familiar. 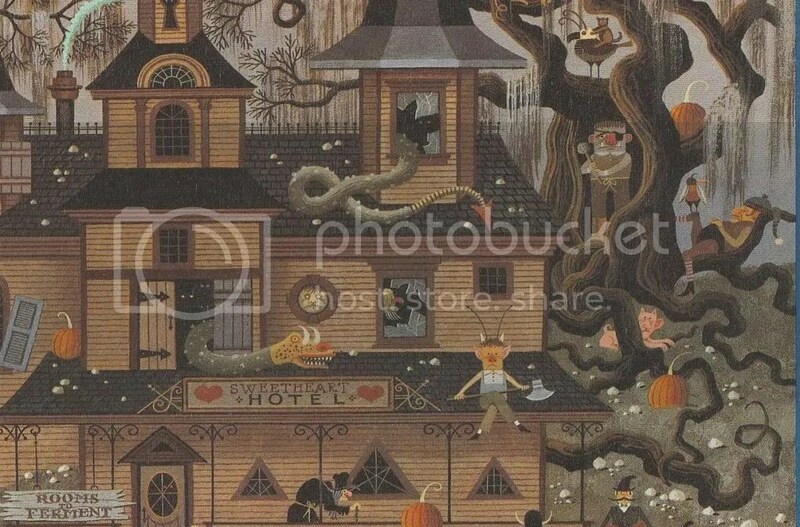 I loved the detailed artwork especially in the Halloween and Christmas scenes. They had so much going on it was like Where’s Waldo chaos but with nothing specific to find. It was just busy and to a seven-year old in with ten TV channels, no VCR and definitely without video games, this was pure entertainment to me. I spent hours staring at this odd world and daydreaming what a horror hotel would be like. This is responsible for my love of Halloween. A few months ago I was thinking about this calendar, in particular October of 1985. 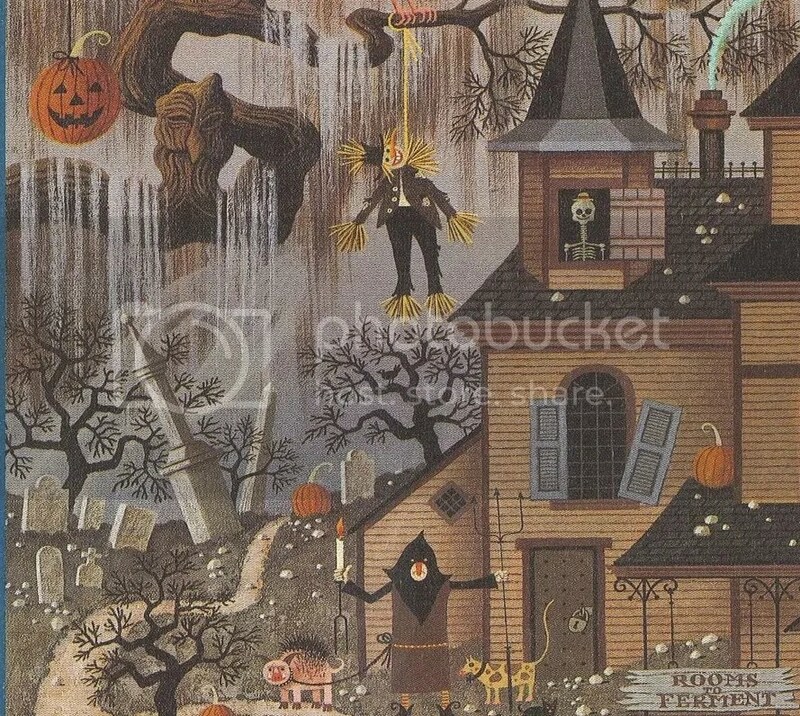 With a few Google searches and some wild guesses like “spooky scene 1980’s calendar”, to my amazement, not only did I find it but I could buy the original. And I did. It’s currently hanging in my office but I took it down to scan and share it with you. Here are some closer images to take a gander at. Good grief, the top corner has some pretty crazy things going on. From a lynched scarecrow to a an executioner walking his spiked pig and cow-cat, it’s hard to wrap you mind around the scene if you didn’t have the whole picture. I’ve been debating whether to send this cropped portion as a Halloween card but all my friends don’t need any further excuse to question my sanity. I am a big fan of the wispy ghosts through the cemetery. I remember thinking of these before bedtime at seven years old. Oh my innocence lost. Holy cats, look at all of this! It’s hard to know where to start but my eyes always go to the Amish Jedediah guy in the broken window. Know idea why because you have a number of crazy creatures carrying hammers and axes, looking menacingly at you. I would make fun of the guy with the ax for the way he is sitting but, you know, he has an ax. I’ll let that one slide. Notice the chipmunk-bear riding a bird? Yeah, I barely did too. And a naked dog…thing. Here we have two gents having a nap, one with a horned dog on his lap. I think they are asleep but judging by the theme, they may well be dead. I’ll leave that up to your imagination but we clearly see a blue hand sticking out of the bag so death isn’t exactly a gamble. Pithia’s Bloodlust Wrinkledeath is by far one of the greatest names to be named a name. Can you imagine your last name being Wrinkledeath? There could only be one profession for you! If you weren’t a body remover you had to at least be a pro wrestler. This is funny because back in the day the girls in my second grade class wore these pants which had straps for their feet. I believe they called them stirrups. I always thought the guy with bare feet was wearing girl pants. That dates me as an old man. So there is my little piece of my history which explains what made Halloween so special to me. There are thousands of these types of memories but it’s rare to own one and get to relieve it, if only for a few minutes. Wow, I never saw these before. It is amazing and needs to be framed. I see this artist’s name on the jigsaw puzzles my wife buys a lot. She is always buying this style of artwork. 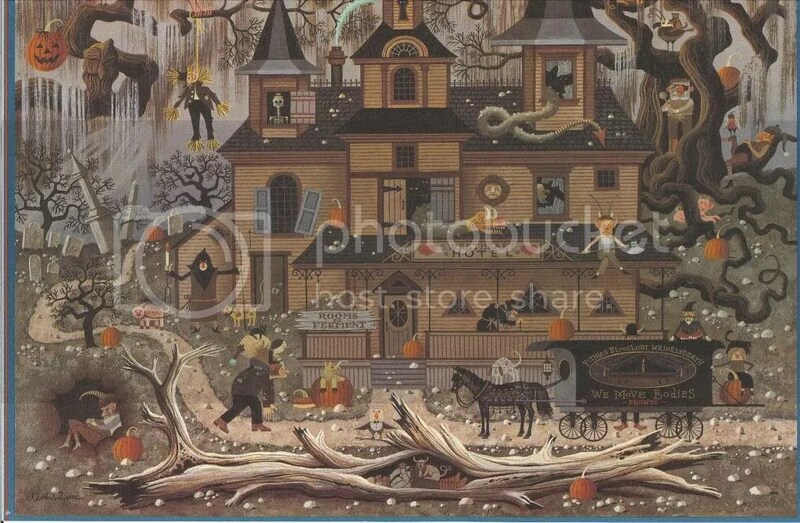 She has a Halloween one (from a similar artist but not Wysocki), but it’s not this cool. I wouldn’t be surprised if this has been made into a puzzle before.